Intermatic FF Series Spring wound countdown timer without hold, replaces standard or decorator 1-Gang wallswitch. This 2-circuit timer automatically limits the ON time for energy consuming loads. The wall-mountable timer with SPDT contact, is compatible with incandescent/fluorescent/CFL/LED loads. 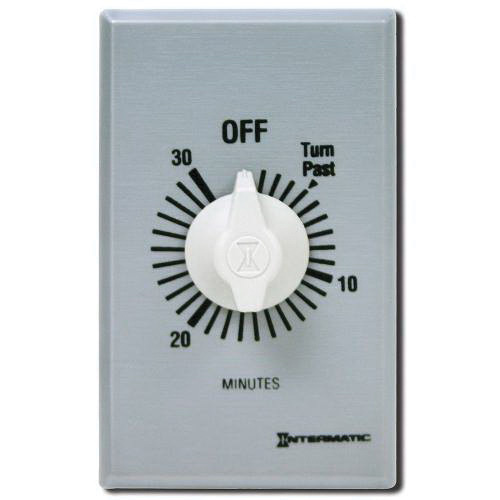 This commercial timer is perfect for bathroom fans, spas, hot tubs, storage closets and garage lights. The 1-Pole timer has a current rating of 20/10-Amps and voltage rating from 125 to 277-Volts AC at 50/60-Hz. The timer without hold, meets cCSAus and cRUus standards.